As I may have noted a few times in the articles, this work just builds on previous work done by a number of people over the years, obviously starting with the whole L4 microkernel effort, the development of Fiasco.OC, L4Re and their predecessors, and the work done to port these components to the MIPS architecture. On the l4-hackers mailing list, Adam Lackorzynski was particularly helpful when I ran into obstacles, and Sarah Hoffman provided some insight into problems with the CI20 just as it was needed. You really don’t have to read all the articles or even any of them! The point of this article is to summarise the work and perhaps make similar porting efforts a bit more approachable for others in the same position: anyone having a vague level of familiarity with L4Re/Fiasco.OC or similar systems, also having a device that might be supported, and being somewhat familiar with writing code that drives hardware. It might be useful to give certain practical details here, if only to indicate the nature of the development and testing routine employed in this endeavour. First of all, I have been using a chroot containing the Debian “unstable” distribution for the i386 architecture. Although this was essential for a time when building the software for the CI20 and trying to take advantage of Debian’s cross-compiler packages, any fairly recent version of Debian would probably be fine because I ended up using a Buildroot toolchain to be able to target the Ben. You could probably choose any Free Software distribution and reproduce what I have done. Some scripts have been included in the patch distribution, one of which should do the tricky job of applying patches to the repository checkout according to the chosen device configuration. Because a centralised version control system (Subversion) has been used to publish the L4Re and Fiasco.OC sources, I had to find a way of working with my own local changes. Consequently, I wrote a few scripts to maintain bundles of changes associated with certain files, and I then managed these bundles in a different version control system. Yes, this effectively meant versioning the changes themselves! Things would be simpler with a decentralised version control system because local commits would be convenient, and upstream updates would be incorporated into the repository separately and merged with local changes in a controlled fashion. One of the corporate participants has made a Git repository for Fiasco.OC available, which may alleviate some issues, although I am increasingly finding larger Git repositories to be unusable on my modest hardware, and I also tend to disagree with everybody deciding to put everything on GitHub. Given a previously-built “user space”, this would bundle the new kernel together with code that might be able to test it. Of particular importance is the bootstrap code which launches the kernel: without that, there is no point in even trying to test the kernel! If that proved successful, an image would then be built and tested. In general, focusing on either the kernel or some user space component meant that there was rarely a need to build a new kernel and then build much of the user space. The patches accumulated during this process cover a range of different areas of functionality. Looking at them organised by functional area, instead of in the more haphazard fashion presented throughout the series of articles, allows for a more convenient review of the work actually needed to get the job done. The first of these is important to remember when adding drivers since it changes the l4/pkg/drivers/Control file and defines the driver “packages” provided by each of the driver libraries. These package definitions help the build system work out which other parts of the system need to be consulted when building a particular driver. Maybe I will try and break out the architecture version changes into specific patch files, provided this does not result in the original source files ending up being patched by multiple patch files. My aim has been to avoid patches having to be applied in a particular order, and that starts to happen when multiple patches modify the same file. One significant objective here is to be able to offer the Ben as a “first class” configuration option and have the build system do the right thing, setting up all the components and code regions that the Ben needs to function. The JZ4780 support is intended for the CI20 and will not be used with the Ben. However, it is convenient to incorporate support for these different platforms in the same patch file in each instance. 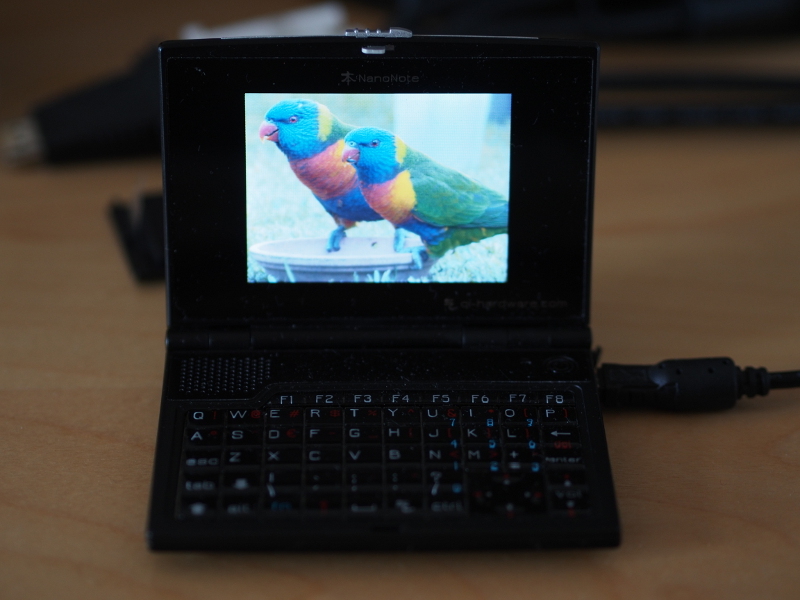 Indeed, it is worth focusing on the LCD driver briefly. The code has its origins in existing driver code written for the Ben that I adapted to get working as part of a simple “bare metal” payload. I have maintained a separation between the more intricate hardware configuration and aspects that deal with the surrounding software. As part of L4Re, the latter involves obtaining access to memory using the appropriate API calls and invoking other drivers. In L4Re, there is a kind of framework for LCD drivers, and the existing drivers seem to be written in C rather than C++. 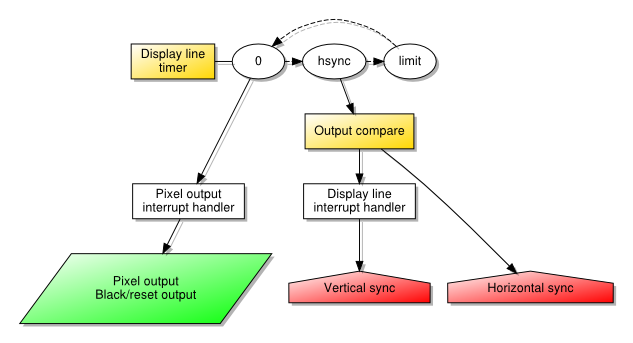 Reminiscent of Linux, there is a mechanism for exporting driver operations using a well-defined data structure, and this permits the “probing” of drivers to see if they can be enabled and if meaningful information can be obtained about things like the supported resolution, colour depth and pixel format. To make the existing code compatible with L4Re, a fair amount of the work involves translating the information already known (and used) in the hardware configuration activity to a form that other L4Re components can understand and use. Originally, for the GPIO driver, I had intended it to operate as part of the Io server framework. Components using GPIO functionality would then employ the appropriate API to configure and interact with the exposed input and output pins. Unfortunately, this proved rather cumbersome, and so I decided to take a simpler approach of providing the driver as an abstraction that a program would use together with explicitly-requested memory. I did decide to preserve the general form of the API for this relocated abstraction, however, meaning that various classes and methods are provided that behave in the same way as those “left behind” in the Io server framework. Thus, a program would itself request access to the GPIO-related memory, and it would then use GPIO-related abstractions to “do the right thing” with this memory. One would envisage that such a program would not be a “normal”, unprivileged program as such, but instead be more like a server or driver in its own right. Indeed, the LCD driver employs these abstractions to use SPI-based signalling with the LCD panel, and it uses the same techniques to configure the LCD clock frequencies using the CPM-related memory and CPM-related abstractions. Although the GPIO driver follows existing conventions, the CPM driver has no obvious precedent in L4Re, but I adopted some of the conventions employed in the GPIO driver, adding more specialised methods and functions to expose functionality specific to the SoC. Since I had previously written a CPM driver for the JZ4780, the main objective was to make the JZ4720/JZ4740 driver resemble the existing driver as much as possible. All configurations reside in the l4/conf/examples directory. All new examples reside in the l4/pkg/examples/misc directory. Since completing the above work, I have already made some progress on the first two of these topics. More on that in an upcoming post! Since writing this article, a few things are worth adding. First of all, the patches produced in the initial effort described by this series of articles are now available in an “initial archive” via the Web page documenting the effort. In contrast, a “current archive” provides patches for the current state of the work, with the aim being to focus these patches only on essential support for these devices within L4Re and Fiasco.OC, and with future development being done elsewhere. The kernel load address and bootstrap start address are now the same as for other MIPS platforms. The exception handlers are positioned 4 kilobytes above the normal exception base just in case overwriting them might upset the bootloader. Previously, I had experienced problems with Mag and its mag-input-libinput plugin, causing me to disable that plugin to get things working. This can be avoided by just providing a capability called “vbus” when starting Mag. After all my effort modifying the Fiasco.OC kernel, adapting driver code for the Ben NanoNote to work in the L4 Runtime Environment (L4Re), I had managed to demonstrate programs that could access the framebuffer and thus show things on the screen. But my stated goal is to demonstrate the functioning of existing code and a range of different components, specifically the “spectrum” example, GUI multiplexer (Mag), and framebuffer driver (fb-drv), supported by additional driver functionality I have added myself. 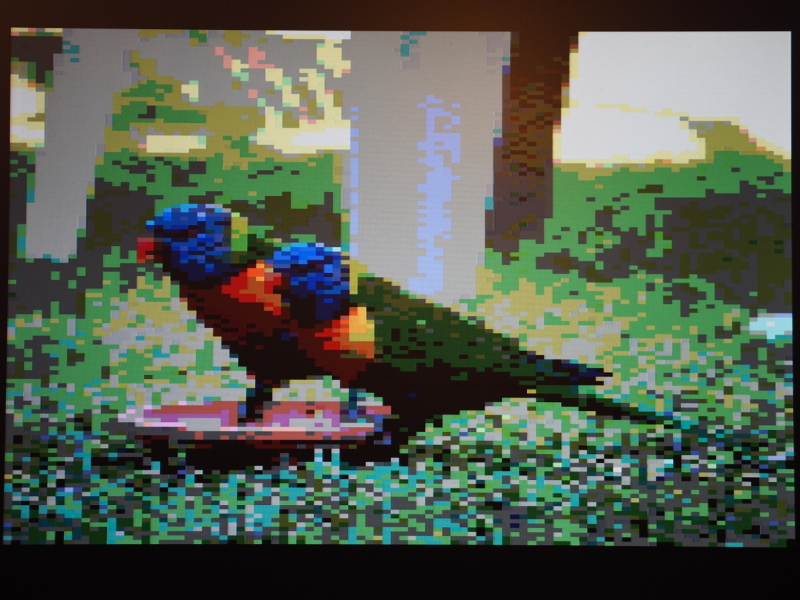 Still to do were the tasks of getting the framebuffer driver to access my LCD driver, getting Mag to work on top of that, and then getting the “spectrum” example to work as it had done with Fiasco.OC-UX. Looking back at this exercise now, I can see that it is largely a case of wiring up the components just as we saw earlier when I showed how to get access to the hardware through the Io server. But this didn’t prevent excursions into the code for some debugging operations or a few, more lasting, modifications. I had sought to test the entire stack consisting of the example, GUI multiplexer, framebuffer driver, and the rest of the software using a configuration derived from both the UX “spectrum” demonstration (found in l4/conf/examples/x86-fb.cfg) and the corresponding demonstration for ARM-based devices (found in l4/conf/examples/arm-rv-lcd.cfg). Unsurprisingly, this did not work, and so I started out stripping down my own example configuration in order to test the components individually. On the way, I learned a few things that I wished I’d realised earlier. The first one is pretty mundane but very important. In order to strip down the configuration, I had tried to comment out various components and had done so using the hash symbol (#), which vim had helped to make me believe was a valid comment symbol. In fact, in Lua, if the hash symbol can be used for “program metadata”, perhaps for the usual Unix scripting declaration, then its use may be restricted to such narrow purposes and no others (as far as I could tell from quickly looking through the documentation). Broader use of the symbol appears to involve it acting as the length operator. By making an assumption almost instinctively, due to the prevalence of the hash character as a comment symbol in Unix scripting, I was now being confronted with “Starting kernel …” and nothing more, making me think that I had really broken something. I had to take several steps back, consider what might really be happening, that the Ned task responsible for executing the configuration had somehow failed, and then come to the realisation that were I able to read the serial console output, I would be staring at a Lua syntax error! It was around this time that I discovered the importance of the naming of certain things, noted previously, and so in the accompanying Io configuration, the devices are added to a vbus called “fbdrv”. What this example should do is to run just the framebuffer driver (fb-drv) and the Io server. Meanwhile, in the source file providing the screen data (l4/pkg/fb-drv/server/data/splash1.c), I saw that the width and height of the image were given as being 480 pixels and 65 pixels respectively. The Ben’s screen is 320 pixels wide and 240 pixels high, thus preventing the supplied image from being shown. It seemed worthwhile trying to replace this image just to reassure myself that the driver was actually working. The supplied image was exported from GIMP and so I attempted to reproduce this by loading one of my own images into GIMP, cropping to 320×240, and saving as a C source file with run-length encoding, 3 bytes per pixel, just as the supplied image had been created. I then copied it into the appropriate package subdirectory (l4/pkg/fb-drv/server/data) and modified the Makefile (l4/pkg/fb-drv/server/src/Makefile), changing it to reference my image instead of the supplied one. 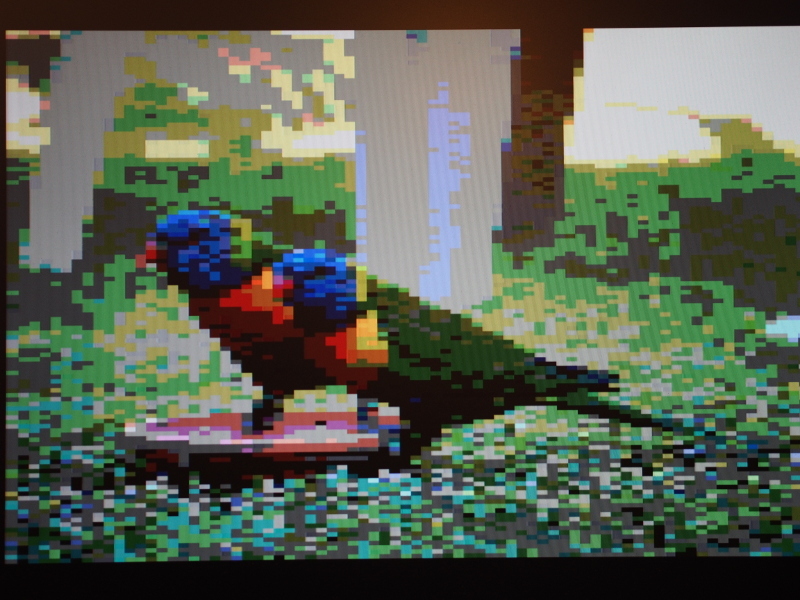 So, the framebuffer driver will happily run, showing its splash screen until something connects to it and gets something else onto the screen. Here, we just let it run by itself until it is time to switch off! There was still one component to be tested before arriving at the “spectrum” example: the GUI multiplexer, Mag. But testing it alone did not necessarily seem to make sense, because unlike the framebuffer driver, Mag’s role is merely to arbitrate between different framebuffer clients. So testing it and some kind of example together seemed like the only workable strategy. 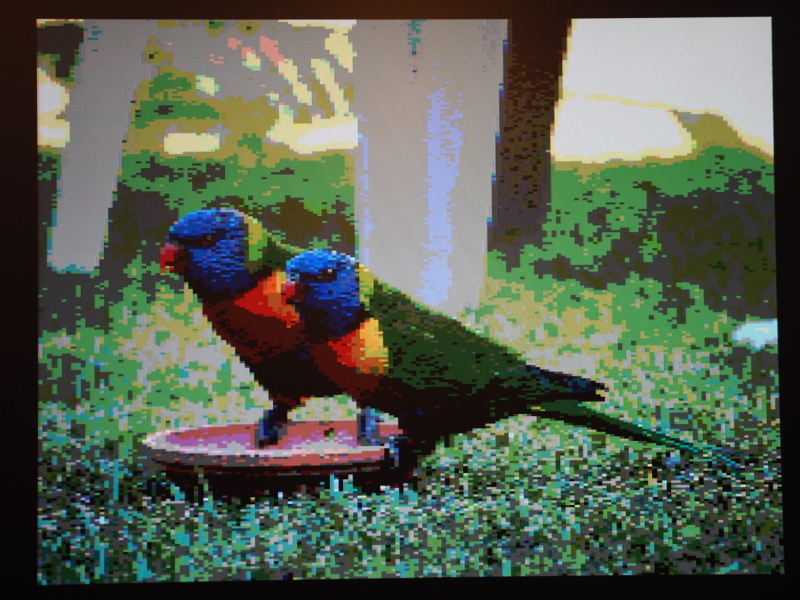 I tried to test it with the “spectrum” example, but I only ever saw the framebuffer splash screen, so it seemed that either the example or Mag wasn’t working. But if it were Mag that wasn’t working, how would I be able to find my way to the problem? I briefly considered whether Mag had a problem with the display configuration, given that I had already seen such a problem, albeit a minor one, in the framebuffer driver. I had wondered whether f was being presented with a null value and thus stopping Mag right there, but since there was a suitable factory object being created for the Ben’s pixel format, it seemed rather unlikely. So, the only approach I had considered at this point was not a particularly convenient one: I would have to replicate Mag piece by piece until discovering which part of it caused it to fail. I set out with a simple example borrowing code from Mag that requests a memory region via a capability or channel, displaying some data on the screen. This managed to work. I then expanded the example, adding various data structures, copying functionality into the example directory from Mag, slowly reassembling what Mag had been all along. Things kept working, right until the point where I needed to set the example going as a server rather than have it wait in an infinite loop doing nothing. Then, the screen would very briefly show the splash image, then the bit patterns, and then go blank. But maybe Mag was going to clear the framebuffer anyway and thus the server loop was working? Perhaps this was what success actually looked like under these circumstances, which is to say that it did not involve seeing two brightly-coloured birds on a lawn. At this point, out of laziness, I had avoided integrating the plugins into my example, and that was the only remaining difference between it and Mag. I started to realise that maybe it was a matter of removing things from Mag and seeing if I could get it to work, and the obvious candidates for removal were the plugins. So I removed all the plugins as defined in the Makefile (found at pkg/mag/server/src/Makefile) and tested to see if it changed Mag’s behaviour. Sure enough, the screen went blank. I then added plugins back one by one, knowing by now that the mag-client_fb plugin was going to be required to get the example working. Given that I haven’t addressed the matter of supporting input devices, which for the Ben would mostly concern the keyboard, disabling this errant plugin seemed like a reasonable compromise for now. Update: a description of a remedy for the problem with the plugin is described in the summary article. There isn’t much left to be said, which perhaps makes the ending something of an anticlimax. But perhaps this is part of the point of the exercise, that the L4Re/Fiasco.OC combination now just seems to work on the Ben NanoNote, and that it could potentially in future be just another thing that this software supports. Of course, the Ben is such a relatively rare device that it isn’t likely to have many potential users, but the SoC family of which the JZ4720 is a part is employed by a number of different devices. 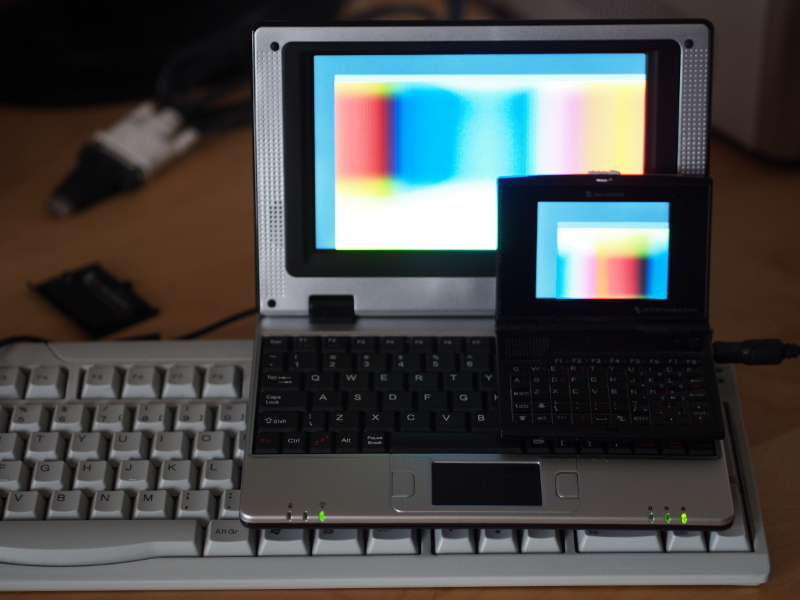 If there haven’t been any privately-maintained ports of this software to those other devices, then this work potentially opens the door to its use on other handheld devices like the GCW Zero or any number of randomly-sourced pocket games consoles, portable media players, and even smartwatches and wearable devices, all of which have been vehicles for the SoC vendor’s products. The Letux 400 could probably be supported given the similarity of its own SoC, the JZ4730, to that used in the Ben. When the Ben was released, work had been done, first by the SoC vendor, then by the Qi Hardware people, to provide a functioning GNU/Linux system for the device. Clearly, there isn’t an overwhelming need for another kind of system if the intention is to just use the device with existing Free Software. But perhaps this is another component in this exercise: to make other technological solutions possible and to explore avenues that get ignored as everyone follows the mainstream. The Ben is hardly a mainstream product itself; why not use it to make other alternative choices? It seems interesting to consider writing other drivers for the Ben and to gain experience with microkernel-based systems design. The Genode framework might also be worth investigating, given its focus on becoming a system suitable for deployment to end-users. The Hurd was also ported in an exploratory fashion to one of the L4 implementations some time ago, and revisiting this might be possible, even simplifying the effort thanks to the evolution in features provided by implementations like Fiasco.OC. In any case, I hope that this account has been vaguely interesting and entertaining. If you managed to read it all, you deserve my sincere thanks for spending the time to do so. A summary of the work will probably follow, and the patches themselves are available on a page dedicated to the effort. Good luck with your own investigations into alternative Free Software operating systems! With some confidence that the effort put in previously had resulted in a working Fiasco.OC kernel, I now found myself where I had expected to be at the start of this adventure: in the position of trying to get an example program working that could take advantage of the framebuffer on the Ben NanoNote. In fact, there is already an example program called “spectrum” that I had managed to get working with the UX variant of Fiasco.OC (this being a kind of “User Mode Fiasco” which runs as a normal process, or maybe a few processes, on top of a normal GNU/Linux system). However, if this exercise had taught me nothing else, it had taught me not to try out huge chunks of untested functionality and then expect everything to work. It would instead be a far better idea to incrementally add small chunks of functionality whose correctness (or incorrectness) would be easier to see. Thus, I decided to start with a minimal example, adding pieces of tested functionality from my CI20 experiments that obtain access to various memory regions. In the first instance, I wanted to see if I could exercise control over the LCD panel via the general-purpose input/output (GPIO) memory region. At this point, I should make a brief detour into the matter of making peripherals available to programs. Unlike the debugging code employed previously, it isn’t possible to just access some interesting part of memory by taking an address and reading from it or writing to it. Not only are user space programs working with virtual memory, whose addresses need not correspond to the actual physical locations employed by the underlying hardware, but as a matter of protecting the system against program misbehaviour, access to memory regions is strictly controlled. This is Lua source code, with Lua having been adopted as a scripting language in L4Re. Here, the important things are those appearing within the hw:match function call brackets: each of these values refers to a device defined in the Ben’s hardware description (found in l4/pkg/io/io/config/plat-qi_lb60/hw_devices.io), identified using the “hid” property. 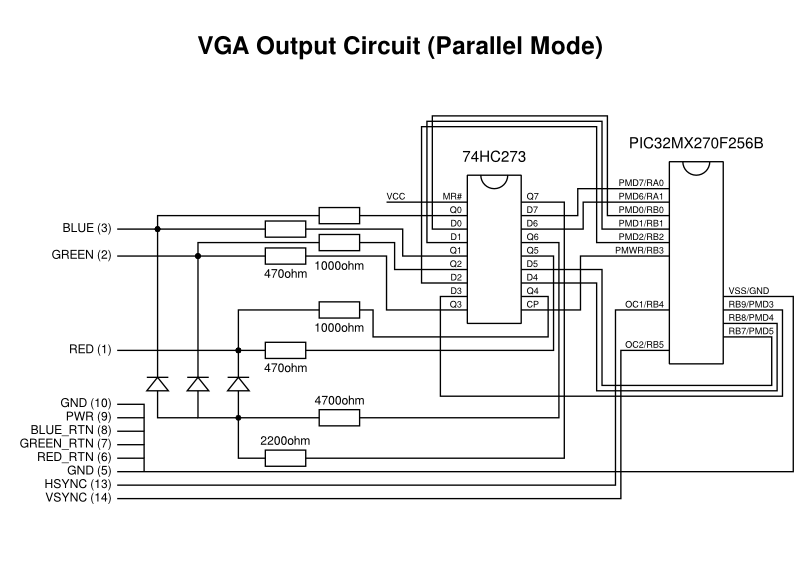 The “jz4740-gpio” value is used to locate the GPIO device or peripheral, for instance. Here, the “devices” name seemingly needs to be consistent with the name used in the caps mapping for the Io server, set up in the first l:start invocation. The name used for the io_buses mapping can be something else, but then the references to io_buses.devices must obviously be changed to follow suit. I am sure you get the idea. The consequence of this wiring up is that the example program, set up at the end, accesses peripherals using the vbus capability or channel, communicating with Io and requesting access to devices, whose memory regions are described in the Ben’s hardware description. Io acts as the server on this channel whereas the example program acts as the client. There were a few good reasons for trying GPIO access first. 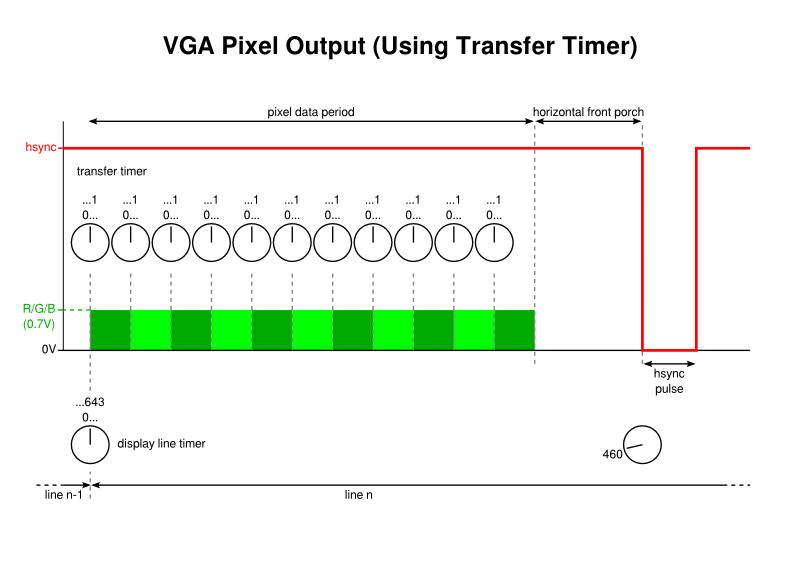 The most significant one is related to the framebuffer. As you may recall, as the kernel finished starting up, sigma0 started, and we could then no longer be sure that the framebuffer configuration initialised by the bootloader had been preserved. So, I could no longer rely on any shortcuts in getting information onto the screen. Another reason for trying GPIO operations was that I had written code for the CI20 that accessed input and output pins, and I had some confidence in the GPIO driver code that I had included in the L4Re package hierarchy actually working as intended. Indeed, when working with the CI20, I had implemented some driver code for both the GPIO and CPM (clock/power management) functionality as provided by the CI20′s SoC, the JZ4780. As part of my preparation for this effort, I had adapted this code for the Ben’s SoC, the JZ4720. It was arguably worthwhile to give this code some exercise. One drawback with using general-purpose input/output, however, is that the Ben doesn’t really have any conveniently-accessed output pins or indicators, whereas the CI20 is a development board with lots of connectors and some LEDs that can be used to give simple feedback on what a program might be doing. Manipulating the LCD panel, in contrast, offers a very awkward way of communicating program status. Experiments proved somewhat successful, however. Obtaining access to device memory was as straightforward as it had been in my CI20 examples, providing me with a virtual address corresponding to the GPIO memory region. Inserting some driver code employing GPIO operations directly into the principal source file for the example, in order to keep things particularly simple and avoid linking problems, I was able to tell the panel to switch itself off. This involves bit-banging SPI commands using a number of output pins. The consequence of doing this is that the screen fades to white. I gradually gained confidence and decided to reserve memory for the framebuffer and descriptors. Instead of attempting to use the LCD driver code that I had prepared, I attempted to set up the descriptors manually by writing values to the structure that I knew would be compatible with the state of the peripheral as it had been configured previously. But once again, I found myself making no progress. No image would appear on screen, and I started to wonder whether I needed to do more work to reinitialise the framebuffer or maybe even the panel itself. But the screen was at least switched on, indicating that the Ben had not completely hung and might still be doing something. One odd thing was that the screen would often turn a certain colour. Indeed, it was turning purple fairly consistently when I realised my mistake: my program was terminating! And this was, of course, as intended. The program would start, access memory, set up the framebuffer, fill it with a pattern, and then finish. I suspected something was happening and when I started to think about it, I had noticed a transient bit pattern before the screen went blank, but I suppose I had put this down to some kind of ghosting or memory effect, at least instinctively. Accessing the LCD peripheral directly from my example is all very well, but I had always intended to provide a display driver for the Ben within L4Re. Attempting to compile the driver as part of the general build process had already identified some errors that had been present in what effectively had been untested code, migrated from my earlier work and modified for the L4Re APIs. But I wasn’t about to try and get the driver to work in one go! Instead, I copied more functionality into my example program, giving things like the clock management functionality some exercise, using my newly-enabled framebuffer output to test the results from various enquiries about clock frequencies, also setting various frequencies and seeing if this stopped the program from working. This did lead me on another needlessly-distracting diversion, however. When looking at the clock configuration values, something seemed wrong: they were shifted one bit to the left and therefore provided values twice as large as they should have been. I emitted some other values and saw that they too were shifted to the left. 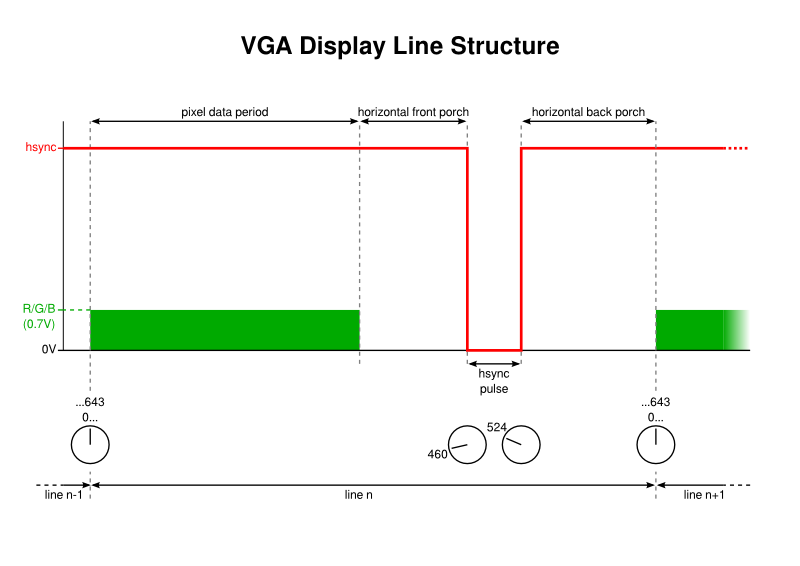 For a while, I wondered whether the panel configuration was wrong and started adjusting all sorts of timing-related values (front and back porches, sync pulses, video-related things), reading up about how the panel was configured using the SPI communications described above. It occurred to me that I should investigate how the display output was shifted or wrapped, and I used the value 0×80000001 to put bit values at the extreme left and right of the screen. Something was causing the output to be wrapped, apparently displaced by 9 pixels or 36 bytes to the left. if ((i % 10) == 0)                     // move to the next bit? 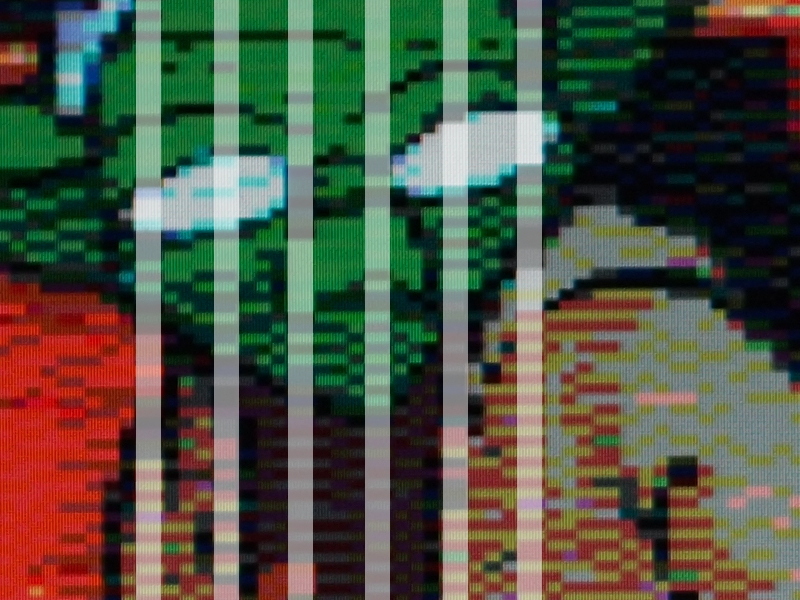 That’s right: I had accidentally reordered the increment and “next bit” tests, causing the first bit in the value to occupy only one pixel, prematurely skipping to the next bit; at the end of the value, the mask would wrap around and show the remaining nine pixels of the first bit. Again, I was debugging the debugging and wasting my own time! But despite such distractions, over time, it became interesting to copy the complete source file that does most of the work configuring the hardware from my driver into the example directory and to use its functions directly, these functions normally being accessed by more general driver code. In effect, I was replicating the driver within an environment that was being incrementally enhanced, up until the point where I might assume that the driver itself could work. …and then writing data to the screen just as I had done before. Indeed, this worked just like the previous example, indicating that I had managed to implement the driver’s side of the mechanisms correctly. I had a working LCD driver! If the final objective had been to just get Fiasco.OC running and to have a program accessing the framebuffer, then this would probably be the end of this adventure. But, in fact, my aim is to demonstrate that the Ben NanoNote can take advantage of the various advertised capabilities of L4Re and Fiasco.OC. This means supporting facilities like the framebuffer driver, GUI multiplexer, and potentially other things. And such facilities are precisely those demonstrated by the “spectrum” example which I had promised myself (and my readership) that I would get working. At this point, I shouldn’t need to write any more of my own code: the framebuffer driver, GUI multiplexer, and “spectrum” example are all existing pieces of L4Re code. But what I did need to figure out was whether my recipe for wiring these things up was still correct and functional, and whether my porting exercise had preserved the functionality of these things or mysteriously broken them! With all the previous effort adjusting Fiasco.OC and the L4Re bootstrap code, I had managed to get the Ben NanoNote to run some code, but I had encountered a problem entering the kernel. When an instruction was encountered that attempted to clear the status register, it would seem that the boot process would not get any further. The status register controls things like which mode the processor is operating in, and certain modes offer safety guarantees about how much else can go wrong, which is useful when they are typically entered when something has already gone wrong. When starting up, a MIPS-based processor typically has the “error level” (ERL) flag set in the status register, meaning that normal operations are suspended until the processor can be configured. The processor will be in kernel mode and it will bypass the memory mapping mechanisms when reading from and writing to memory addresses. As I found out in my earlier experiments with the Ben, running in kernel mode with ERL set can mask problems that may then emerge when unsetting it, and clearing the status register does precisely that. With the kernel’s _start routine having unset ERL, accesses to lower memory addresses will now need to go through a memory mapping even though kernel mode still applies, and if a memory mapping hasn’t been set up then exceptions will start to occur. This tripped me up for quite some time in my previous experiments until I figured out that a routine accessing some memory in an apparently safe way was in fact using lower memory addresses. This wasn’t a problem with ERL set – the processor wouldn’t care and just translate them directly to physical memory – but with ERL unset, the processor now wanted to know how those addresses should really be translated. And since I wasn’t handling the resulting exception, the Ben would just hang. I had a long list of possible causes, some more exotic than others: improperly flushed caches, exception handlers in the wrong places, a bad memory mapping configuration. I must admit that it is difficult now, even looking at my notes, to fully review my decision-making when confronting this problem. I can apply my patches from this time and reproduce a situation where the Ben doesn’t seem to report any progress from within the kernel, but with hindsight and all the progress I have made since, it hardly seems like much of an obstacle at all. Indeed, I have already given the game away in what I have already written. 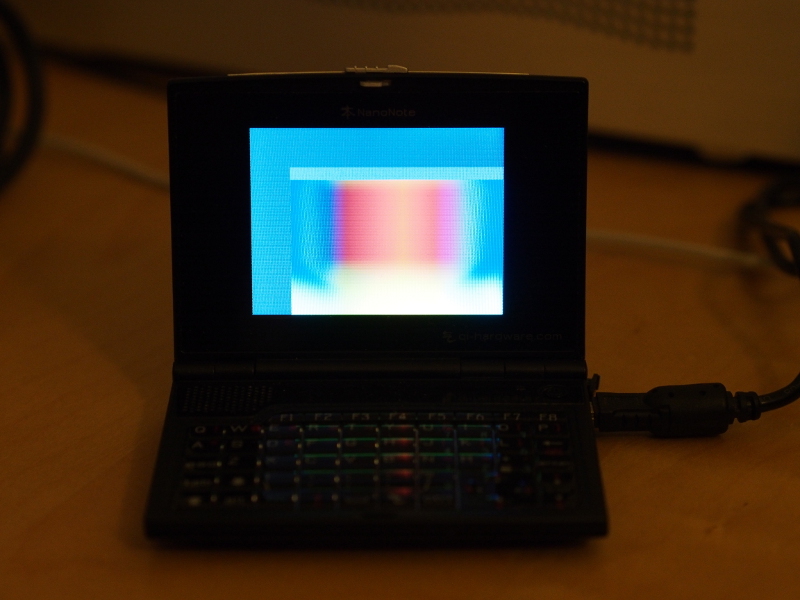 Taking over the framebuffer involves accessing some memory set up by the bootloader. In the bootstrap code, all of this memory should actually be mapped, but since ERL is set I now doubt that this mapping was even necessary for the duration of the bootstrap code’s execution. And I do wonder whether this mapping was preserved once the kernel was started. But what appeared to happen was that when my debugging code tried to load data from the framebuffer descriptor, it would cause an exception that would appear to cause a hang. Since I wanted to make progress, I took the easy way out. Rather than try and figure out what kind of memory mapping would be needed to support my debugging activities, I simply wrapped the code accessing the framebuffer descriptor and the framebuffer itself with instructions that would set ERL and then unset it afterwards. This would hopefully ensure that even if things weren’t working, then at least my things weren’t making it all worse. It now started to become possible to track the progress of the processor through the kernel. From the _start routine, the processor jumps to the kernel_main function (in kernel/fiasco/src/kern/mips/main.cpp) and starts setting things up. As I was quite sure that the kernel wasn’t functioning correctly, it made sense to drop my debugging code into various places and see if execution got that far. This is tedious work – almost a form of inefficient “single-stepping” – but it provides similar feedback about how the code is behaving. I hadn’t noticed this earlier, and its effect is to terminate the kernel if it detects an architecture revision just like the one provided by the JZ4720. There were a few other tests of the capabilities of the processor that needed to be either disabled or reworked, and I spent some time studying the documentation concerning configuration registers and what they can tell programs about the kind of processor they are running on. Amusingly, our old friend the rdhwr instruction is enabled for user programs in this code, but since the JZ4720 has no notion of that instruction, we actually disable the instruction that would switch rdhwr on in this way. Although we are not quite finished with the kernel, the next significant obstacle involved starting programs that are not part of the kernel. Being a microkernel, Fiasco.OC needs various other things to offer the kind of environment that a “monolithic” operating system kernel might provide. One of these is the sigma0 program which has responsibilities related to “paging” or allocating memory. Attempting to start such programs exercises how the kernel behaves when it hands over control to these other programs. We should expect that timer interrupts should periodically deliver control back to the kernel for it to do work itself, this usually involving giving other programs a chance to run. I was seeing the kernel in the “home straight” with regard to completing its boot activities. The Kernel_thread::init_workload method (in kernel/fiasco/src/kern/kernel_thread-std.cpp) was pretty much the last thing to be invoked in the Kernel_thread::run method (in kernel/fiasco/src/kern/kernel_thread.cpp) before normal service begins. But it was upon attempting to “activate” a thread to run sigma0 that a problem arose: the kernel never got control back! This would be my last major debugging exercise before embarking on a final excursion into “user space”. We left off last time with the unenviable task of debugging a non-working system. In such a situation the outlook can seem bleak, but I mentioned a couple of strategies that can sometimes rescue the situation. The first of these is to rule out areas of likely problems, which in my case tends to involve reviewing what I have done and seeing if I have made some stupid mistakes. Naturally, it helps to have a certain amount of experience to inform this process; otherwise, practically everything might be a place where such mistakes may be lurking. One thing that bothered me was the use of the memory map by Fiasco.OC on the Ben NanoNote. When deploying my previous experimental work to the Ben, I had become aware of limitations around where things might be stored, at least while any bootloader might be active. Care must be taken to load new code away from memory already being used, and it seems that the base of memory must also be avoided, at least at first. I wasn’t convinced that this avoidance was going to happen with the default configuration of the different components. Of particular concern were the exception vectors – where the processor jumps to if an exception or interrupt occurs – whose defaults in Fiasco.OC situate them at the base of kernel memory: 0×80000000. If the bootloader were to try and copy the code that handles exceptions to this region, I rather suspected that it would immediately cause problems. #define CONFIG_BOOTCOMMANDFROMSD        "mmc init; ext2load mmc 0 0x80600000 /boot/uImage; bootm"
The location of the rest of the payload seems to be configured by just changing DEFAULT_RELOC_mips32 in the bootstrap package’s build scripts (in l4/pkg/bootstrap/server/src/Make.rules). With this done, I had hoped that I might have “moved the needle” a little and provoked a visible change when attempting to boot the system, but this was always going to be rather optimistic. Having pursued the first strategy, I now decided to pursue the second. Update: it turns out that a more conventional memory arrangement can be used, and this is described in the summary article. The second strategy is to use every opportunity to get the device to show what it is doing. But how can we achieve this if we cannot boot the kernel and start some code that sets up the framebuffer? Here, there were two things on my side: the role of the bootstrap code, it being rather similar to code I have written before, and the state of the framebuffer when this code is run. I had already discovered that provided that the code is loaded into a place that can be started by the bootloader, then the _start routine (in l4/pkg/bootstrap/server/src/ARCH-mips/crt0.S) will be called in kernel mode. And I had already looked at this code for the purposes of identifying instructions that needed rewriting as well as for setting the “exception base”. There were a few other precautions that were worth taking here before we might try and get the code to show its activity. For instance, the code present that attempts to enable a floating point unit in the processor does not apply to the Ben, so this was disabled. I was also unconvinced that the memory mapping instructions would work on the Ben: the JZ4720 does not seem to support memory pages of 256MB, with the Ben only having 32MB anyway, so I changed this to use 16MB pages instead. This must be set up correctly because any wandering into unmapped memory – visiting bad addresses – cannot be rectified before the kernel is active, and the whole point of the bootstrap code is to get the kernel active! 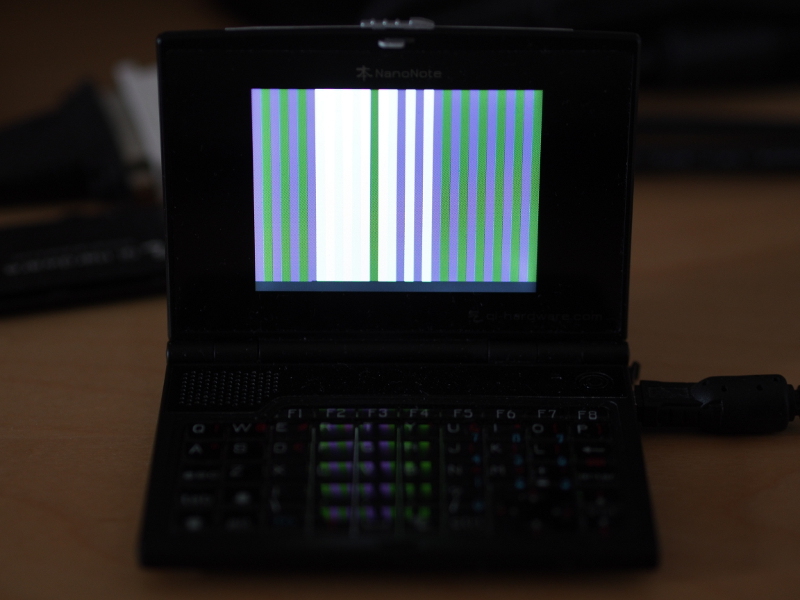 Now, it wasn’t clear just how far the processor was getting through this code before failing somewhere, but this is where the state of the framebuffer comes in. On the Ben, the bootloader initialises the framebuffer in order to show the state of the device, indicate whether it found a payload to load and boot from, complain about error conditions, and so on. It occurred to me that instead of trying to initialise a framebuffer by programming the LCD peripheral in the JZ4720, set up various structures in memory, decide where these structures should even be situated, I could just read the details of the existing framebuffer from the LCD peripheral’s registers, then find out where the framebuffer resides, and then just write whatever data I liked to the framebuffer in order to communicate with the outside world. To summarise, it loads the address of a “descriptor” from a configuration register provided by the LCD peripheral, this register having been set by the bootloader. 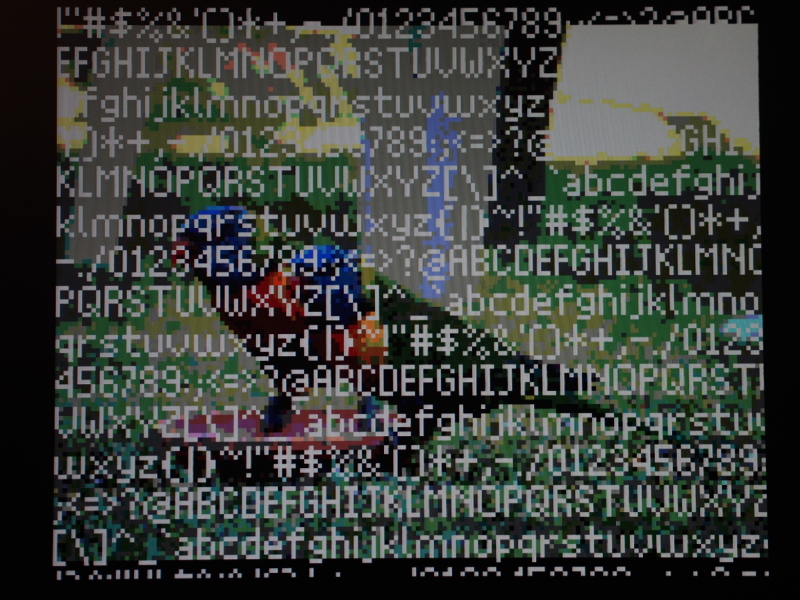 It then examines some members of the structure provided by the descriptor, notably the framebuffer address (fsadr) and size (a subset of ldcmd). Just to show some sign of progress, the code loops and fills the screen with a specific value, in this case a shade of grey. By moving this code around in the bootstrap initialisation routine, I could see whether the processor even managed to get as far as this little debugging fragment. Fortunately for me, it did get run, the screen did turn grey, and I could then start to make deductions about why it only got so far but no further. One enhancement to the above that I had to make after a while was to temporarily change the processor status to “error level” (ERL) when accessing things like the LCD configuration. Not doing so risks causing errors in itself, and there is nothing more frustrating than chasing down errors only to discover that the debugging code caused these errors and introduced them as distractions from the ones that really matter. The bootstrap code isn’t all assembly language, and at the end of the _start routine, the code attempts to jump to __main. Provided this works, the processor enters code that started out life as C++ source code (in l4/pkg/bootstrap/server/src/ARCH-mips/head.cc) and hopefully proceeds to the startup function (in l4/pkg/bootstrap/server/src/startup.cc) which undertakes a range of activities to prepare for the kernel. Here, my debugging routine changed form slightly, minimising the assembly language portion and replacing the simple screen-clearing loop with something in C++ that could write bit patterns to the screen. It became interesting to know what address the bootstrap code thought it should be using for the kernel, and by emitting this address’s bit pattern I could check whether the code had understood the structure of the payload. It seemed that the kernel was being entered, but upon executing instructions in the _start routine (in kernel/fiasco/src/kern/mips/crt0.S), it would hang. This now led to a long and frustrating process of detective work. With a means of at least getting the code to report its status, I had a chance of figuring out what might be wrong, but I also needed to draw on experience and ideas about likely causes. I started to draw up a long list of candidates, suggesting and eliminating things that could have been problems that weren’t. Any relief that a given thing was not the cause of the problem was tempered by the realisation that something else, possibly something obscure or beyond the limit of my own experiences, might be to blame. It was only some consolation that the instruction provoking the failure involved my nemesis from my earlier experiments: the “error level” (ERL) flag in the processor’s status register.